This eye-catching and brick-roofed Sariaya landmark near the church, is an Art Deco style house designed by European schooled architect Andres Luna de San Pedro, the son of artist Juan Luna. 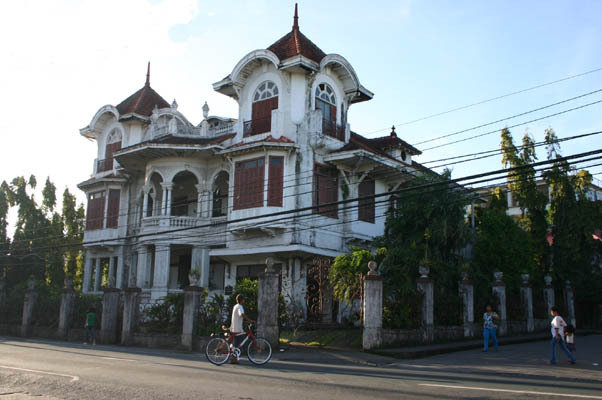 It was built in 1931 by erstwhile Tayabas Provincial Governor Natalio Enriquez (1941 - 1945) and his wife Susana Gala. A venue for fabulous social gatherings in pre war Sariaya, it hosted the grand reception during the 1938 wedding of their daughter Alicia to Manuel Gala where Philippine Commonwealth First Lady Aurora Aragon Quezon served as principal sponsor. It was declared by the National Historical Institute as a Heritage House on May 14, 2008.